For the last nine months, I’ve been writing a new play as part of The Vagrancy‘s new play development workshop. This new play is inspired by Ibsen’s classic drama HEDDA GABLER. In Ibsen’s play, Hedda Gabler burns the manuscript written by Eilert Lövborg, her former lover. The world never knew what was written in that book. 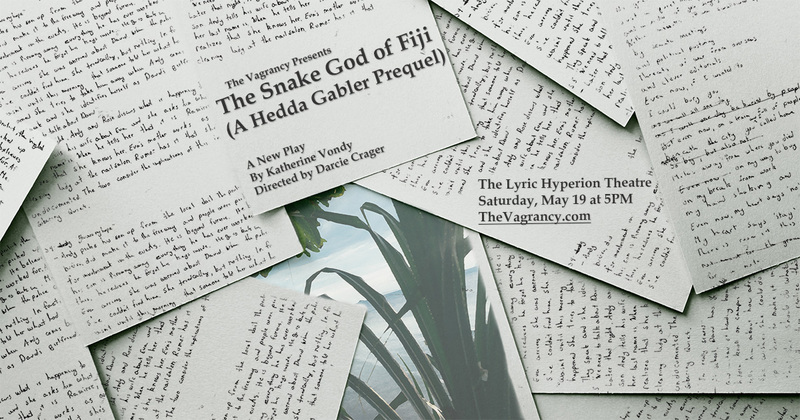 Exploring the roles that memory and desire have in storytelling, THE SNAKE GOD OF FIJI (A HEDDA GABLER PREQUEL) tells the peculiar tale of this mysterious book’s creation. Now, the reading is finally here! Directed by Darcie Crager, the reading will star Nicky Romaniello, Nicolette Acosta, Cameran Surles, Zoey Bond, and Garrett Walters, with stage directions by Danielle Gonzales. Tickets are pay-what-you-can, so if you’re interested in finding out what in the world Fiji could possibly have to do with a Norwegian play from over a century ago, please come to the Lyric Hyperion in Silver Lake on Saturday, May 19th at 5 PM to check it out!